I’m off to Bahrain on Tuesday to spend the Islamic festival of Eid Al Adha with family & friends. Being an Indian resident of the UAE, I will need a visit visa to enter Bahrain. 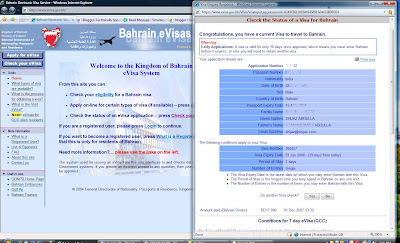 I was delighted to know that a Bahrain visit visa’s can be applied for and received over the internet! The Bahrain government has taken a great step forward in simplifying the visa application process and making it available online. You simply visit the Bahrain eVisa website, enter the required passport information, make sure that you meet the eligibility and submit your application. The fees for issuing the visa is paid online by credit card. Within 3 days, the authorities will verify your application and you can print your visa online. Bon voyage! Hi I have been browsing the internet for sometime to find appropriate details in order to visit Bahrain and somehow, i landed up on your site. Really very helpful esp that i never had an idea that they can even do an electronic visa which is great.